The main market is located at the north end of town - a traditional style market catering primarily to the locals and carrying the usual products: vegetables, fruits, meats, bulk rice, motor parts, moneychangers, etc. Phsar Kronat (‘Old Market’ ) on the boulevard off the riverfront reopened a couple of years ago and now includes souvenir and clothing shops, several little cafes, al fresco restaurants at both ends, a convenience store, several tour operators and real estate agents. Two or three convenience stores are located on Durian Monument traffic circle, offering a pretty good selection of imported goods, canned foods, snacks, beer, spirits, wines, water and sundries. One of the stores also has a pharmacy. Some of the guesthouses and hotels offer small selections of souvenirs, usually focused on local products such as Kampot pepper, Cambodian coffee, locally made bags, handicrafts, clothes and cards. And there are now a few proper souvenir and clothing shops in town, as well as a book store. Old school bookshop and souvenir shop with a heart. Locally made and produced Cambodian souvenirs, especially hand made lawn games, kites, gifts and more. You can also buy games and supplies to be donated to locals schools and kids in need. Second hand books for sale and a book nook to relax and read. On guesthouse street, near the Salt Worker Traffic Circle. A Cambodian social enterprise combining skills training and employment opportunities. Shop offering a good selection of handmade women’s clothing and accessories, most in comfortable cotton - dresses, skirts, blouses, bags, purses and more. Located next to the Old Market. Cool little souvenir shop in Phsar Kronath, near the riverside of the market. In addition to the usual Cambodian and Kampot souvenirs (pepper, teas, etc), the shop is crowded with eclectic collection of nostalgia, old posters and photos, Cambodian paintings, curios and funky, comfortable clothing. Founded by members of The Cambodian Space Project, KAMA is a professional not-for-profit arts organization whose mission is to develop and present locally produced music and art to audiences around the world. KAMA's live music venue "The Sun Ra Space Bar" offers food, drinks, groovy artworks and live music. See Dining listing. Located opposite the 2000 Roundabout, #58 Street 726. New riverfront souvenir shop carrying a wide variety of Cambodian handicrafts, souvenirs, clothes and other Cambodian products. Local basketry, Kampot pepper, Cambodian crafts and jewelry, NGO products, bags and purses from recycled rice bags, also comfortable clothes, sunglasses and such. Riverfront souvenir shop carrying a surprising wide and complete variety of Cambodian handicrafts, souvenirs, clothes and other Cambodian products. Local basketry, Kampot pepper, Cambodian crafts and jewelry, NGO products, bags and purses from recycled rice bags, also comfortable clothes, sunglasses and such. Large selection of the famous Kampot-grown pepper, some of the finest black pepper in the world. Kampot-grown black, red and white pepper, available in different packagings. Also selling Cambodian grown coffee. Like the name says, the specialty is tiny pillows hade made locally. 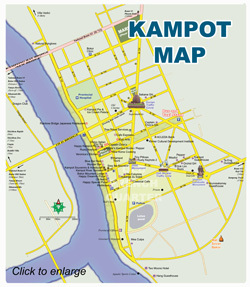 A unique Kampot gift. Also offering a variety of other local products including pepper, coffees, palm sugar, quilts, kramas, bags and more. On the 2000 Monument intersection. 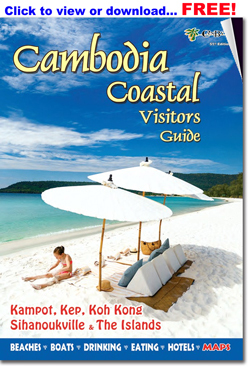 Kepler’s Kampot Books carries a good selection of used and new novels and Cambodia related titles for buy/sell/trade. Souvenirs for sale. 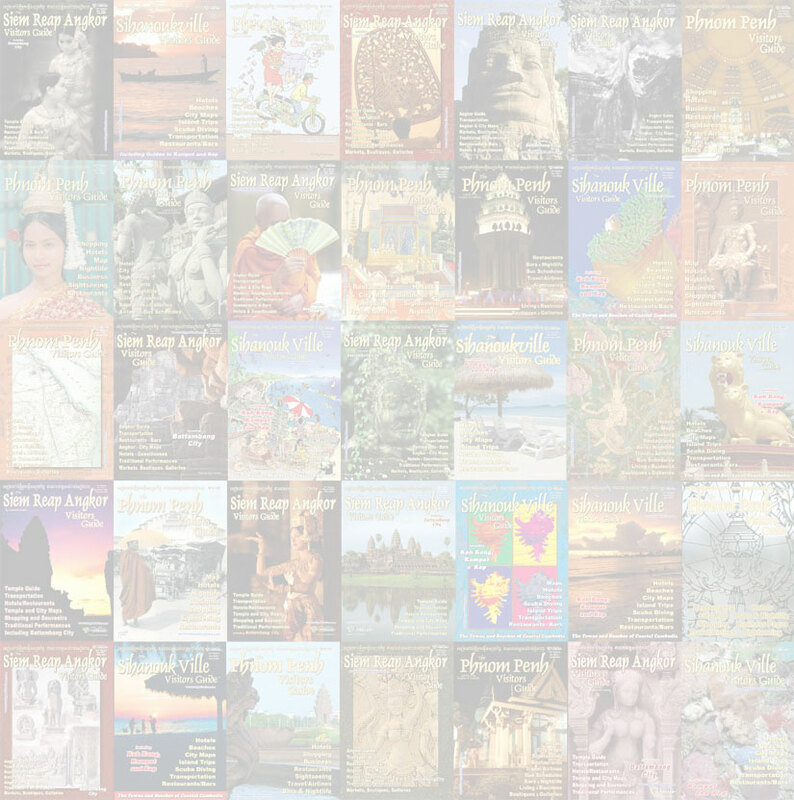 Kampot pepper, statues, t-shirts, postcards, Recycled Products and more. Also provides, print, scan and internet services. Located next to the old market in the middle of town.